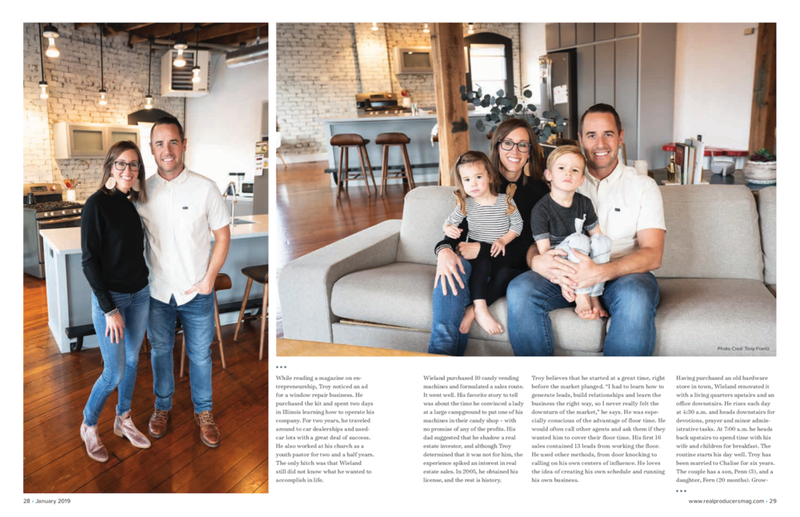 Troy Wieland spent a good deal of time and effort determining the choice of a career, and, for all considerations, he made the wise decision. 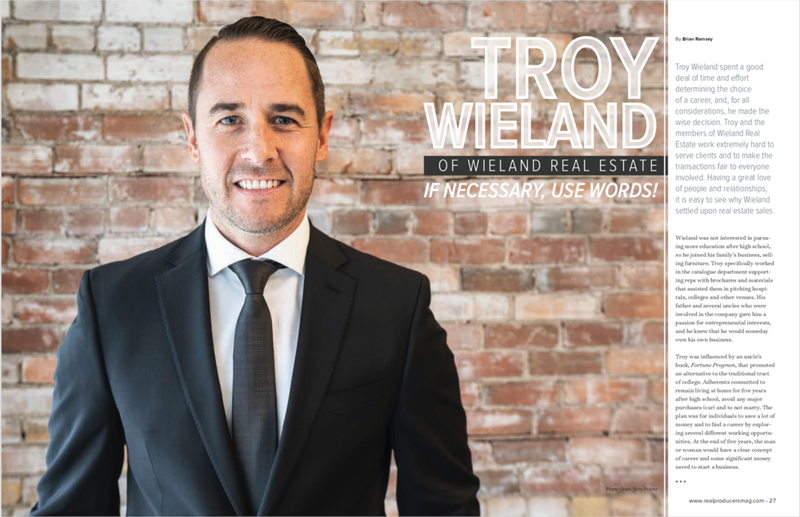 Troy and the members of Wieland Real Estate work extremely hard to serve clients and to make the transactions fair to everyone involved. 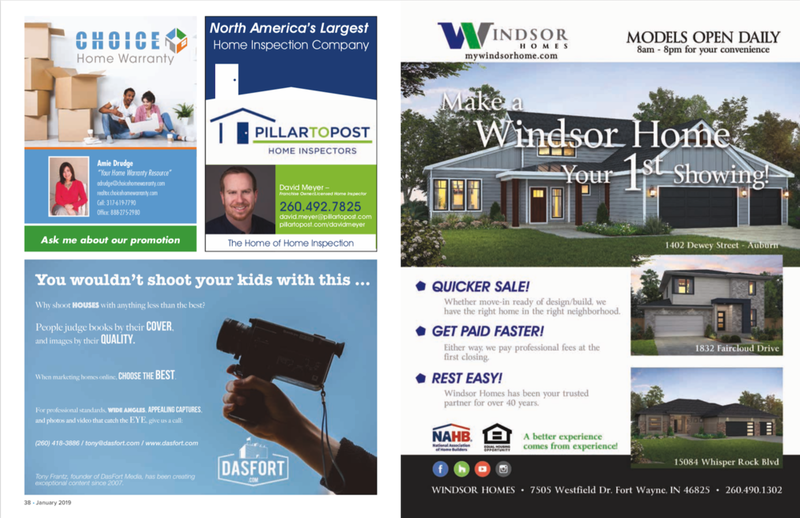 Having a great love of people and relationships, it is easy to see why Wieland settled upon real estate sales. Wieland was not interested in pursuing more education after high school, so he joined his family’s business, selling furniture. Troy specifically worked in the catalogue department supporting reps with brochures and materials that assisted them in pitching hospitals, colleges and other venues. His father and several uncles who were involved in the company gave him passion for entrepreneurial interests, and he knew that he would someday own his own business. Troy was influenced by an uncle’s book, Fortune Program, that promoted an alternative to the traditional tract of college. Adherents committed to remain living at home for five years after high school, avoid any major purchases (car) and to not marry. The plan was for individuals to save a lot of money and to find a career by exploring several different working opportunities. At the end of five years, the man or woman would have a clear concept of career and some significant money saved to start a business. While reading a magazine on entrepreneurship, Troy noticed an ad for a window repair business. He purchased the kit and spent two days in Illinois learning how to operate his company. For two years, he traveled around to car dealerships and used-car lots with a great deal of success. He also worked at his church as a youth pastor for two and a half years. The only hitch was that Wieland still did not know what he wanted to accomplish in life. Wieland purchased 10 candy vending machines and formulated a sales route. It went well. His favorite story to tell was about the time he convinced a lady at a large campground to put one of his machines in their candy shop - with no promise of any of the profits. His dad suggested that he shadow a real estate investor, and although Troy determined that it was not for him, the experience spiked an interest in real estate sales. In 2005, he obtained his license, and the rest is history. Troy believes that he started at a great time, right before the market plunged. “I had to learn how to generate leads, build relationships and learn the business the right way, so I never really felt the downturn of the market,” he says. He was especially conscious of the advantage of floor time. He would often call other agents and ask them if they wanted him to cover their floor time. His first 16 sales contained 13 leads from working the floor. He used other methods, from door knocking to calling on his own centers of influence. He loves the idea of creating his own schedule and running his own business. Troy promotes the idea of living the right things by action first, and that is how he built his company. For those who want to enter the world of real estate sales, Troy cautions them on thinking that it is easy and immediately lucrative. “It is about creating awareness and building your own brand,” he notes. He uses social media to build that brand. Troy is a big believer in handwritten notes and keeping oneself “top of mind” in others. He observes that is is okay to promote yourself by just giving facts. He recalls sending a congratulations note to someone he knew and then getting a call the next week to find him a home. Troy Wieland seeks to build a quality business with quality people. He notes that the agency has a great culture that knows how to treat people. In fact, that is his desired legacy: to have people say that his team treated everyone in the transaction process fairly. Wieland knows that extends from one’s character. He mentions St. Francis of Assisi’s quote of “Preach Jesus, and if necessary, use words.” Troy promotes the idea of living the right things by action first, and that is how he built his company. I have been a realtor about three years. Career volume is about 9.2 million. 2018 about 3.5 when all is said and done. I achieved executive club status for RE/MAX in 2017 and 2018. I started my career in August of 2015, but didn’t close my first transaction until February of 2016. Getting started can be quite discouraging, but perseverance pays off. I graduated from Niagara University in New York with my bachelor’s in Hotel and Restaurant Management. Anyone that has worked in that industry knows it can be tough. It taught me so much and helped to shape who I am today. I was blessed to have the opportunity to be at home with my boys as they were growing. I have run restaurants that grossed millions a year, and that job paled in comparison to the demands of being a stay-at-home mom. I also loved my time spent as PTC President at their elementary school, and try to remain as active as I can to this day. My clients mean the world to me, and as I see it they are the reason I am passionate about what I do. I think so often, realtors forget that we have such a major part of our clients’ lives in our hands, and that deserves a great deal of consideration and understanding. The most rewarding part of my job is the opportunity I am given to establish relationships with my clients. It is such a joy to be able to check in with my past clients, and see where their lives have taken them. Babies born, changing jobs, and unfortunately some have moved away. But, I what a gift I am given to be part of their lives. 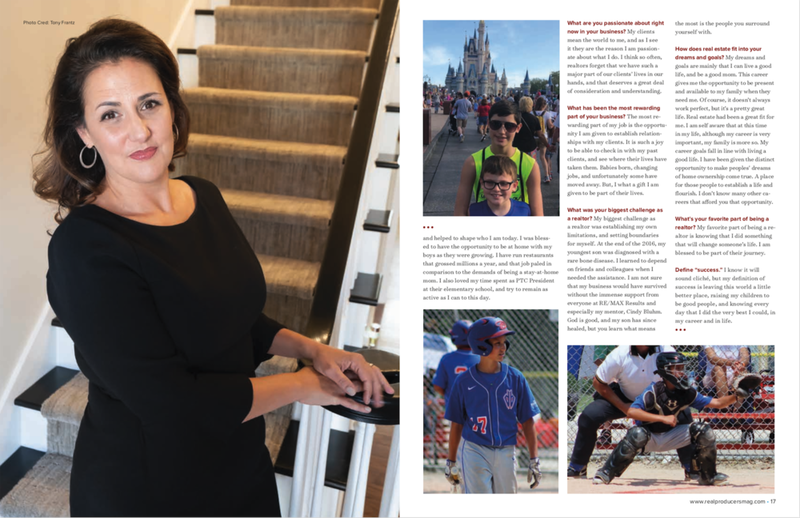 My biggest challenge as a realtor was establishing my own limitations, and setting boundaries for myself. At the end of the 2016, my youngest son was diagnosed with a rare bone disease. I learned to depend on friends and colleagues when I needed the assistance. 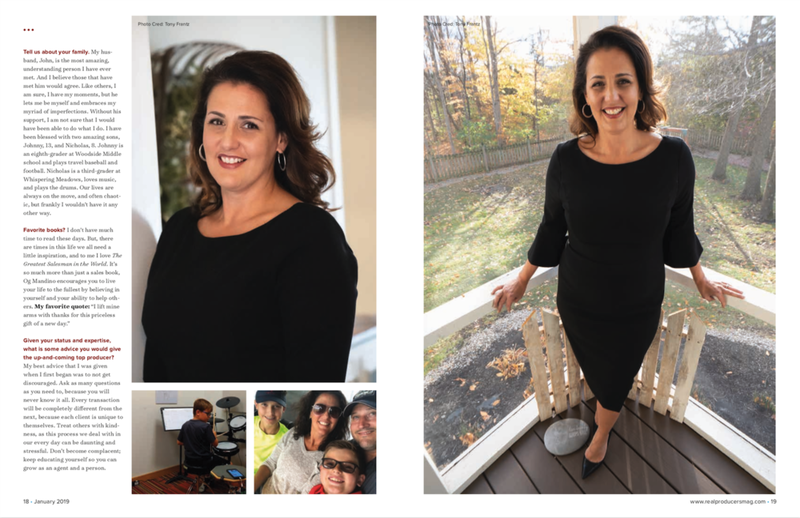 I am not sure that my business would have survived without the immense support from everyone at RE/MAX Results and especially my mentor, Cindy Bluhm. God is good, and my son has since healed, but you learn what means the most is the people you surround yourself with. My dreams and goals are mainly that I can live a good life, and be a good mom. This career gives me the opportunity to be present and available to my family when they need me. Of course, it doesn’t always work perfect, but it’s a pretty great life. Real estate had been a great fit for me. I am self aware that at this time in my life, although my career is very important, my family is more so. My career goals fall in line with living a good life. I have been given the distinct opportunity to make peoples’ dreams of home ownership come true. A place for those people to establish a life and flourish. I don’t know many other careers that afford you that opportunity. My favorite part of being a realtor is knowing that I did something that will change someone’s life. I am blessed to be part of their journey. I know it will sound cliché, but my definition of success is leaving this world a little better place, raising my children to be good people, and knowing every day that I did the very best I could, in my career and in life. My husband, John, is the most amazing, understanding person I have ever met. And I believe those that have met him would agree. Like others, I am sure, I have my moments, but he lets me be myself and embraces my myriad of imperfections. Without his support, I am not sure that I would have been able to do what I do. I have been blessed with these two amazing sons, Johnny, 13, and Nicholas, 8. Johnny is an eighth-grader at Woodside Middle school and plays travel baseball and football. Nicholas is a third-grader at Whispering Meadows, loves music, and plays the drums. Our lives are always on the move, and often chaotic, but frankly I wouldn’t have it any other way. Given your status and expertise, what is some advice you would give the up-and-coming top producer? My best advice that I was given when I first began was to not get discouraged. Ask as many questions as you need to, because you will never know it all. Every transaction will be completely different from the next, because each client is unique to themselves. Treat others with kindness, as this process we deal with in our every day can be daunting and stressful. Don’t become complacent; keep educating yourself so you can grow as an agent and a person.